Clout can probably be categorized as a disease these days. At this point, people will do anything for some cheap likes on Instagram, throwing their friends under the bus, showing inappropriate amounts of skin or just generally acting a fool. On Offset’s debut album Father Of 4, the Migos rapper discusses how things have become so toxic in the music industry because of “clout” and his wife Cardi B joined him. After teasing the official arrival of the “Clout” music video yesterday, the couple has dropped the clip on their channels. In her verse, Cardi B speaks on the “fake news” epidemic where media outlets race to be the first to report on something, even though it may not necessarily be true. “I should run a whole blog at this rate/They using my name for clickbait,” she raps. The video shows Offset wearing a mask and playing a vivid yellow piano before mobbing out in a mirrored room. The yellow theme continues throughout the entirety of the video when Cardi appears in a pile of lemons, pulling on her sunshine-coloured pigtails as she sings. 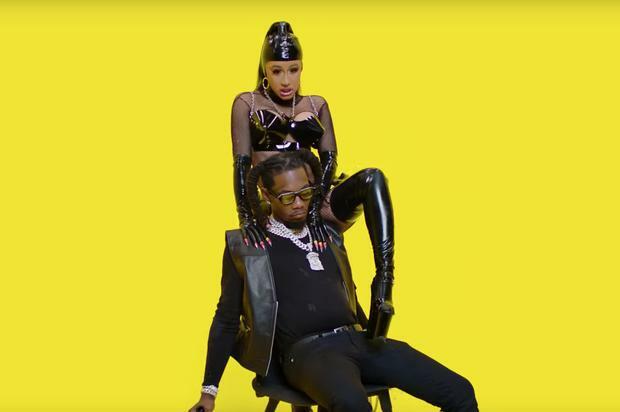 As you would expect from a Cardi and Offset clip, there are some pretty explicit scenes in here. While there may not be as many as usual, the director still managed to feature a couple of scenes where the female rapper grinds on her husband’s lap.